So I volunteered to be one of the hosts (hostesses?) for a progressive dinner for charity. A progressive dinner is where the appetizers, main and dessert courses are each served at different homes. I'm doing the appetizers. Since this fundraiser brings out major contributors, you don't just heat up store-bought frozen puffs and pass around a bottle of ketchup. These people deserve major bang for their donation bucks. So I've been testing a few recipes that catch my eye here and there. 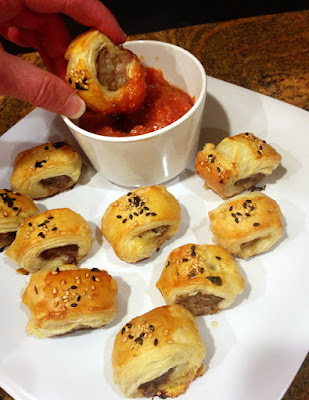 Such as these from-scratch sausage rolls, served with from-scratch tomato dipping sauce.